When people think about transportation infrastructure, they tend to think of roads, bridges, and railways. Vertical transportation is becoming increasingly important as cities expand. There have been several technological innovations in recent years. The Shanghai New World Daimaru Store has the largest spiral escalator in the world. The system is located in the shopping mall’s main atrium and extends up six stories. It consists of 12 escalators arranged in a helix. Mitsubishi Electric, which designed the system, has been producing spiral escalators for 30 years. It uses customized chains that can respond to movement angles to produce smooth, consistent motion and can adjust the center of the spiral to maintain a consistent speed. A sustainable social housing project in Reze, France will have a solar powered elevator from Otis. The Gen2 Switch elevator will get over 80 percent of its power from four solar panels on the roof of the Les Bouderies housing project. It will be able to make up to 100 trips during a blackout by using energy from solar-powered batteries. One World Trade Center will have 71 elevators from ThyssenKrupp. Five super-fast elevators can transport passengers to the observation deck at speeds of up to 37 kilometers per hour, reaching the 102nd floor in as little as a minute. The elevators can reduce noise and minimize vibrations. ThyssenKrupp has also developed multi-directional elevators that use a magnetic motor to travel both laterally and vertically. The elevators travel through a system of horizontal and vertical loop structures. This could dramatically increase elevator efficiency and convenience and save space. Thoth Technology, a Canadian company, patented a design for an inflatable space elevator that would rise 20 kilometers from the Earth’s surface. 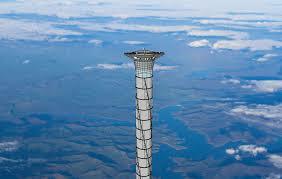 It would have a free-standing tower made from Kevlar-polyethylene tubes held in place with helium. Cars could transport cargo and people from the Earth to a platform at the summit.